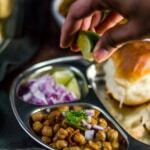 Punjabi Chana Masala (Choley) popularly known as the Indian Chickpea Curry in the US is a robustly flavored curry that can be quickly put together when cooked in a traditional pressure cooker or an Instant Pot. Soak the chickpeas overnight in 5 cups of water and 1/2 a teaspoon of salt. Rinse chickpeas before pressure cooking it in 4 cups of water, along with 2 tea bags and 1/2 a teaspoon of salt (if using a traditional pressure cooker till the vent or whistle goes off 4 times.) Set it aside to cool. When it is safe to open the lid, discard the tea bags. Add ginger and garlic and saute it with the onions for a minute or so. Add tomatoes and continue frying them till they are soft and mushy, and oil begins to leave the sides of this onion-tomato base. Add chole masala, chili powder, and green chilies to this mixture and mix well. Add the cooked chole along with the water it was cooked in. Let it simmer for 10 minutes. Do a taste test and add more salt if required. Serve hot garnished with coriander, onions and freshly squeezed lemon juice. Goes well with bhature or chapatis as well as over rice. Rinse chickpeas before pressure cooking it in 4 cups of water, along with 2 tea bags and 1/2 a teaspoon of salt for 30 minutes in an Instant Pot under high pressure. Set it aside to cool. When it is safe to open the lid, discard the tea bags. Transfer the cooked chole to another vessel. Rinse and wipe dry the Instant Pot. Add oil to the steel insert of the Instant Pot and press the Saute function. Press the Adjust button to move the selection to "low" and wait till the display reads "Hot." Add bay leaf, black pepper, and cloves and let it fry for around 30 seconds and then add onions. Fry the onions till they turn soft and translucent (approximately 12-15 minutes). Add tomatoes and continue frying them till they are soft and mushy, and oil begins to leave the sides of this onion - tomato base. Add chole masala, chili powder, and green chilies to this mixture and mix well. Add the cooked chickpeas along with the liquid it was cooked in. Select the Saute button and set it to low. Let the chana masala curry simmer for 10 minutes. Add more salt if needed. Serve hot garnished with coriander, onions and freshly squeezed lemon juice. Goes well with bhature or chapatis as well as over rice. To save time, you could start with step 3 ie. make the onion-tomato gravy in the Instant Pot and then add the soaked chickpeas to it. Mix it well and pressure cook it for 30 minutes. Though it is the faster approach, I have noticed it yields inconsistent results and sometimes the chickpeas are not cooked through.